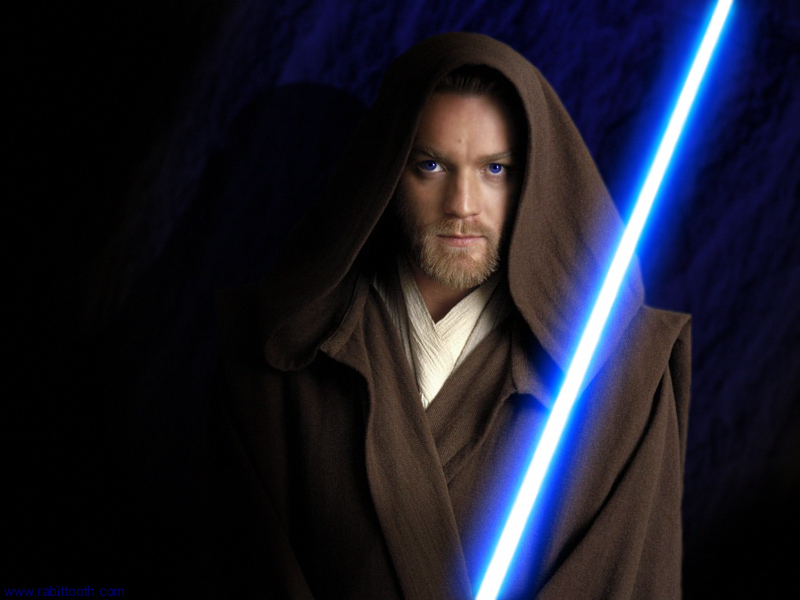 But for all my hard feelings about Episodes I-III, I have to admit that George Lucas got one thing right: casting Ewan McGregor as young Obi-Wan Kenobi. Sir Alec Guinness will forever be the quintessential Obi-Wan, but it takes a very good actor to make you forget, even temporarily, that Guinness wore that brown robe first. Though Episode I was pretty much a lost cause, McGregor was invaluable to “Attack of the Clones” and “Revenge of the Sith.” He was totally credible as a wise and very patient mentor to that petulant future dictator, Anakin Skywalker. He projected the quiet confidence of a guy who would really rather not take you to school via the Force but could do so spectacularly if called for. Frankly, the prequels would have been even less satisfying without him. Whenever McGregor was absent and the story turned back to trade federations or the wooden courtship of Anakin and Padme, I became very aware of my watch. Hayden Christensen may not have been believable as the future Vader, but McGregor inhabited his role in a way that rose above the script and mind-numbing CGI. One of the best scenes is in “Attack of the Clones,” is when Anakin and Obi-Wan walk into a club in search of bounty hunter Zam Wessel. After telling Anakin to be careful while scoping out the joint, Obi-Wan saunters off toward the bar. Scenes like that make me wish that the prequels had gone the route suggested in a great Craked.com essay, focusing more on Anakin and Obi-Wan’s friendship and mutual Jedi badassery than politics and doomed romance. I can only imagine that a better story would have resulted in an even richer performance, and it sure would have given that last lightsaber battle between the two in “Sith” more emotional heft. It’s telling that, in a series that chronicles Anakin’s descent into darkness and shows his heartbroken wife dying, for crying out loud, I came away caring more about Obi-Wan. Such is the power of a strong performance. McGregor filled Guinness’ large shoes admirably and provided an oasis of awesome in the desert. I totally agree with you. Ewan McGregor was the best thing about the prequels. The only good thing actually and I am not going to watch any Star Wars movie in 3-D. If only the movies had been as good as he was. Ya’ know what is really sad? At least to me. If you want the TV “Clone Wars” the stories are so good. The writing is good the characters are interesting. I keep thinking that if this team had made the prequels, well we might like them. More even. My son LOVES “Clone Wars,” and I have to say that it’s pretty darn good. I’ve watched it with him on several occasions. I don’t want to harp, but it all comes down to Lucas’s bad writing and direction as well as some technical decisions (like abandoning real life sets). Actually his ego and the fear he instills on-set is likely the biggest detriment. But back on topic, Ewan was easily the best part of the Prequels. I actually wanted Obi-Wan to have an affair with Padme by the end of the series, continuity be damned. I mean the prequels were one big bad fanfic anyways, right? So who cares? Obi-Wan and Padme! Radical, but I like it. Now that would have really driven Anakin over the edge. I have always loved Obi-Wan even over Han and Luke for me he was the hero of the series. Ewan was fantastic in the role of young Obi and made it seamless when you “see” Alec Guinness as old Obi, that is if one watches the film in numerical sequence. I also love Clone Wars cartoon! Best THING EVER! It is a great show with a lot of thought and it has excellent characters, voice actors, writing and animators. I love the romance shown between Obi and the the Duchess Satine, that is romantic and beautifully done, and I love how they show all the different Jedi ( the females too as Star Wars was very female lacking in the “first three films” and I was let down by that) and telling the stories about some of the clones and the different bounty hunters, Boba Fett has got NOTHING on Cad Bane. Now as for the idea of Obi having an affair with Padame, I am sorry but that is just as jank of an idea as the prequels you all seem to rage against. That is SO out of Obi’s character, and it was bad enough that Anakin thought that was what going on in the first place when he and Obi had their first big lightsaber showdown, or did you forget that? The prequels should have focused on the Ani and Obi’s friendship, and adventures and the reasons why Ani became so swayed by the dark side and why he came to despise all that he had be taught in regards to the dark side of the force. And why the Jedi council fell apart. I do think that Ani and Padame’s love plays a part of the story but it should have been a side story and not the focus. I have to say that I am a tad tired of hearing StarWars fans whinge about the prequels and George Lucas. It is HIS idea to begin with and if he did not have that idea in the first place you would not have Luke, Leia and Han to love so much. The movies are done and complete and like it or not it is George Lucas’ dream, not ours, so take the good with the bad per se and love it warts and all because I think that the good out weighs the bad in all six films. When ever I hear the complaints about the prequels it always reminds me of people who think that they can/could/ would coach their favourite team to the Stanley Cup, or the World Cup if they were in charge. Oh and no I do not think that if I was the coach of the Toronto Maple Leafs that I could take them to the Stanley Cup! Yeah, McGregor was pretty good in those movies. I remember when the prequels came out, my dad remarked how he had obviously studied Obi-wan in the original movies, because he had Guinness’ mannerisms down pat. He was the best part of all three movies. The man did his homework and fit Sir Alec’s Obi Wan perfectly. Great write up of a great performance. I’m embarrassed to say that I’d read that cracked article, and navigated away when I saw the “Prequels” heading. Of course, now I really want that Buddy Cop movie in space – would have happily watched this. I do feel like the recent X-men prequel tackled this story better (if much more compressed) – I could believe Xavier and Magneto’s friendship as easily as I could believe it blowing up in the end. Thank you, Adam! That Cracked article really spoke to me, and it made me sad that we didn’t get that movie. And I’m totally with you on X-Men. That relationship was the heart of the film, and the audience really felt it when things went so very wrong in the end.